So you all saw me trying on the Off Duty Merino jumper before my Boden party and I truly was smitten. Well, the very same day, I got an email from Boden, asking me to get involved in a project they are running in conjunction with Stylist.co.uk. As part of this, I had to pick a Winter Staple item from the current collection. Well, guess how long it took to reply to that one? On Saturday, my Winter Staple arrived and since then I've been getting increasingly excited about how much wear I'm going to get from this jumper - it's got endless possibilities. Today, I share a couple of looks to prove this. First up - with faded Maison Scotch jeans and grey ankle boots..this is going to be a popular outfit. I love its simplicity. 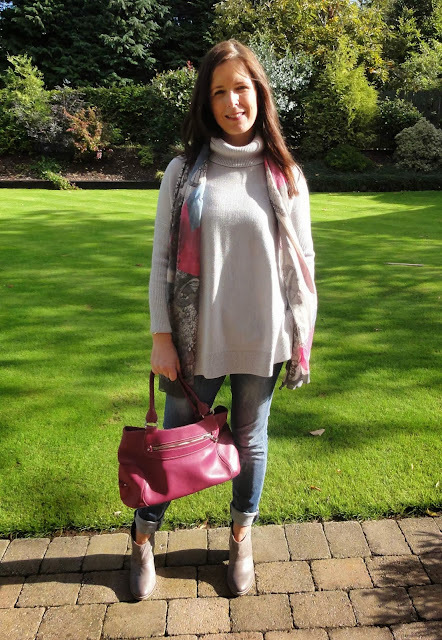 Add a pop of colour with my Cole Haan (ancient) pink leather bag and a great scarf and you're good to go..
Now I've had some emails about this jumper as many of you are interested in it since I first featured it. It's not cheap - even with 20% off, it comes in at just over £70. But it is 100% Machine Washable Merino Wool - so you're buying a quality fabric for a start. I am not normally a fan of chunky warm knitwear (apart from when it's baltic outside!) as I think it mostly adds bulk but this jumper hangs so nicely, it doesn't do that at all. It is a boxy shape so is best suited to wearing with a slim fitting trouser or jean. If you prefer a more fitted top, the Favourite Roll Neck is a neater fitting option (but size up!). Overall, I feel for a piece of knitwear in a classic shape and colour like this, it's worth paying a little more for. The reviews online tie in with what I'm saying too so do have a read of them if you want more opinions. Oh and it comes in cashmere too if you're looking for something to add to your Christmas list! Oh my ... that jumper looks AMAZING and even from these pictures I can see it's so super soft - I want to stroke the jumper!! I tend to avoid chunky knits for the same reasons but this looks fab, a real winter staple. Really love those Clarks boots! Think it will be great with your Maison Scotch patterned jeans too. I had a jumper in this shape from Uniqlo last year and wore it to death. Gorgeous jumper!! Wish I could wear something like that but high necks just seem to make my chest look huge!! I love the first combination. Simple as it comes. And I remember Joanna (Poppy's Style) having something very similar in black last year which had me hankering after a black version. And you say they do it in cashmere? Yum-meeeee. Love that style jumper for casual wear and keeps you warm enough without having to add a coat whilst shopping etc! Oh, that's really made me laugh! You in the middle .. and Fiona & I on either side, wine in one hand and gently stroking your sleeve with the other LOL!!!! The jumper looks lovely- did you size down or get your normal size? Thank you! Think I might invest after your fantastic blog!